There are two primary ways of looking at data capture – from a UX angle and a GDPR perspective. However before we get into the nitty gritty, we’re going back to basics. What Does Data Capture Mean? Everytime we ask someone for their personally identifiable information (PII) we are performing a ‘data capture.’ Whether that’s asking a friend for their new number or a client for their postal address. This seemingly insignificant act has a number of rules and regulations. Furthermore, each one of us has data protection responsibilities. When we innocently handover someone’s email address or phone number without permission, we breach legislation. Understandably, the data protection responsibilities of organisations are much more sophisticated. What Are Data Capture Method? Paper-based forms of data capture (i.e. sign-up sheets and raffles) are increasingly outdated (and insecure). Therefore most data capture now occurs online – making it much easier to protect, use and keep track of. Often this is through a form, delivered by email, on a website or at an event. What Are Data Capture Forms? Any-time you’ve signed up for a newsletter, to a competition or registered for an account through an e-commerce checkout process, you’ll have completed a data capture form. These often ask for your name, phone number and address, and are complete with a ‘submit’ button. This isn’t just polite and good from a UX perspective, but it also a GDPR necessity. If you have to scroll endlessly to complete the form, visitors will drop off. 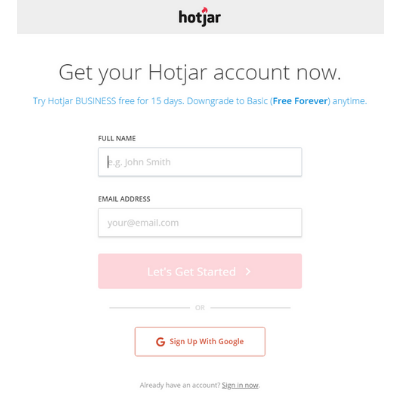 Try out Hotjar’s heatmap analysis to find sticky fields and the page fold. Responsiveness is key. Beyond this – ensure your form is easy to use in mobile, including drop down menus, radio buttons etc. Your conversion button should SCREAM submit – think uppercase text, bold and contrasting colours and a clear button-shape. KEY POINT: If you are using a welcome mat (landing page lightbox data capture) on your website, make sure you aren’t being penalised by Google’s mobile pop-up penalty. Data capture at events is one of the few metrics you can have for the ROI of conference/exhibition attendance. Mailchimp has a special tablet-friendly form to facilitate this (much simpler and safer than using paper records). Nowadays, all organisations should ensure that data capture is digital. This can be using a simple tool like a Mailchimp newsletter sign-up plugin on your website. Or it could be something more creative like specialist customer acquisition using gamification and interactive campaigns. Whatever your data capture method, you must ensure transparency. Read More: Clickbait Uncovered: Are You Making These 4 Responsible Marketing Mistakes? Every business has different data capture requirements. The best way to create your own template is to look at best practise examples (like Hotjar above) and craft a wireframe, using a tool like Balsamiq or Google Drawings to suit your needs. The most recent legislation on data protection in the EU is the GDPR. The Information Commissioner’s Office has a comprehensive guide to help you ensure compliance. Similarly, from an ethical marketing standpoint, it is key to ensure you only ask for the information you need, keep it safe and secure and destroy it at the appropriate time. By Rachael Bews| 2018-12-13T11:11:21+00:00 November 26th, 2018|Categories: Insight Content Marketing Blog|Tags: Conversion, Data Capture, Design, Events, Forms, Friction, GDPR, ROI, UI, UX|Comments Off on Data Capture Design: Are You Making These 6 Mistakes?